Early Detection, Better Protection !!! Water warning detector WWD can be mounted direct on floor to sense water and moisture with sensing pins under the unit or mounted on the wall with the external water detection tape WDT. Water warning detector WWD have relay output. The relay output for water warning leak detector WWD provides an alarm signal for connection to a BMS controller or remote alarm annunciation panel. Water warning detector WWD 102N is without buzzer. Water warning detector WWD 103N is with buzzer (audible alarm). 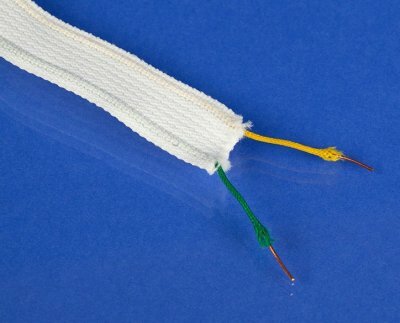 The water detection tape WDT is made of texturiced stockinet-knitted polyester in which parallel uninsulated wires of soft annealed copper are woven. 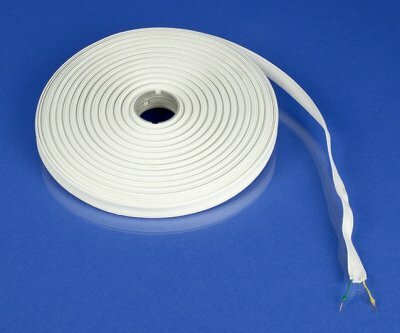 The water detection tape WDT indicating the presence of moisture or water/liquid between the wires. The water warning detectors WWD is tested by placing a wet finger at the sensing pins under the unit. Testing of the water warning detector WWD together with the water detection tape WDT is made by placing a wet finger at the end of the wires of the water detection tape WDT. The LED in the front on the water warning detector WWD will light and the relay output will be activated. Water warning ldetector WWD senses the change in conductivity when moisture or water is in contact with the sensing pins under the unit and when moisture or water is in contact with the external water detection tape WDT. When moisture or water disapear, the water warning detector WWD will be reset by automatic. Water warning detectors WWD can be used together with water detection tape WDT. Water warning detectors WWD can also be used as stand alone. Water detection tape WDT can be used with other water warning detectors. Water leaks can cause great damage to your property. Water leaks can cause large economic loss. Use VCP leak detection products to protect your property, ecomomy and time.